Pull Along Wooden Lion is the a lovely little king of the jungle pull a long toy with blue wheels. 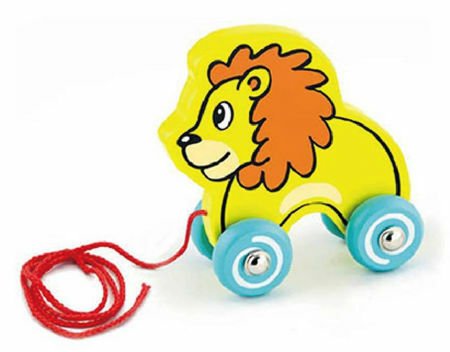 This lion pull a long has metal axles and a riveted wheel to make it extra strong and survive all those laps around the house. Ideal for eighteen months plus this is a great toy to push along or pull by its attached cord. Size: 14cm x 14cm x 6.8cm. We like this because: "Lovely traditional toy."